Humab is a new start-up company that is developing transgenic mouse platforms that can produce fully human antibodies using genomic recombination technology. The company was founded in 2018 by CEO Oh Chang-Gyu, who had led transgenic animal-related projects in Macrogen and Toolgen. 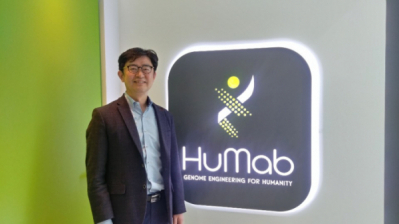 Humab has successfully developed its unique proprietary technology that directly targets the antibody production site of mice and human genes, unlike the first- and second-generation gene transformation technologies that require repetitive engineering to replace and transfer human antibody genes. Humab’s technology includes phage display technology and transgenic mouse technology that can produce antibodies using 100 % human genes. The phage display technology produces antibodies by expressing a variable region where an antibody binds to an antigen on the outer surface of a bacteriophage, and by the selection of phases with specific binding to the antigen concerned. The first human antibody drug that applied this phage display technology was ‘Adalimumab’, which was approved in 2002. HUMIRA, which is used as a treatment for autoimmune diseases, ranked top in sales in 2017, with a global annual sale of KRW 21 trillion. Phage display technology, which succeeded in the commercialization of fully human antibodies, won the Nobel Prize in Chemistry 2018 in recognition of its impact. Transgenic mouse technology produces human antibodies by removing the antibody-producing genes of mice, and inserting human antibody genes. This technology is capable of producing antibodies to various antigens, by securing a diversity of antigen-binding sites among antibody sites. While the transgenic mouse technology was first introduced in the mid-1990s, the second- and 2.5 generation technologies have been developed through technological improvement since the introduction of the first-generation technology. The disadvantage of the first-generation technology is the low level of antibody completeness due to the limitations of gene engineering and delivery methods. The second-generation technology, developed by overcoming such disadvantage, engineers genes using bacterial artificial chromosomes (BAC), and then inserts them into the target sites. By precisely deleting mouse gene at a target site and inserting human gene, the completeness of human antibody is further improved. Humab said, “We plan to prove the effectiveness of our transgenic mouse production technology, and to complete the prototype development within this year.” After applying for PCT patent registration this year, the company will validate the effectiveness of the Synthese platform through the analysis of 12 biomarkers (such as the PNAS article). After completing the platform verification, the company will embark on the development of biobetters and biosimilars. The ultimate goal is to develop an antibody drug. Genomictree’s diagnostic kit can predict 90 % of colorectal cancer.